It takes 3 buoys to practice. This Saturday was announced to be a sunny windy day. So we decided to ask our club to lay out a mini race course with 3 buoys. They made us a start line with 2 buoys and the third buoy was used for the upwind mark. This way we had a quick and cheap way to practice or manoeuvres and starting skills. No club personnel or rib was needed. Starting procedure was as follows: Gill made a warning sign by sounding a horn 3 times and after 10 seconds he made a horn signal for the 3 minutes starting sequence. Everyone had to start after those 3 minutes and be fair not to start early. This procedure went very well, everyone was honest and we even had some very exiting close starts. The course was small, so in 15 minutes we were at the upwind mark, and then in 5 minutes back at the gate. We did this twice for one race and 4 races were held in total. We enjoyed this concept very well and learned a few things. The other club members were thrilled also since we were with 9 boats in total! The first 2 races we scored 2 bullets, yeah baby! 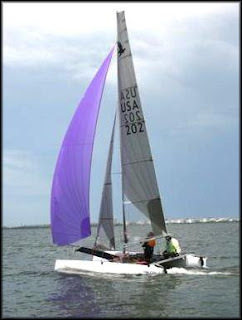 Everything went very smooth, from the start, over our upwind trim and to our downwind speed and depth. We noticed that we had learned alot from last weeks Zwinrace and we had a huge lead over the number 2 and three boats. The third race we underestimated the current. Tide was coming in and the direction of the current was equal with the direction of the wind. So at the upwind mark we had to be very careful! In the last round of the third race we rounded the upwind buoy, Gill was still in trapeze, I was in front ready to pull the spinnaker when suddenly BOOM a huge break and I almost tipped over the boat. Our speed went from 10 knots to 0 knots in a split second. Our daggerboard was caught on the buoy rope. Damn! This took us a while to get loose, so no results for 3rd race. The current was so strong (we just had spring tide) that 4 other boats also got caught. Check out the video below. The 4th race started well, we were second to tack for the upwind mark. But the other boat (Infusion) who sailed a bit higher but below us, played it well and pushed us over the layline. We waited for them to tack and when we tacked we noticed that we were over the layline so we had to bear away a lot. And we stuffed it! We both got slung to the front of the boat and somewhere I hurt my foot so we decided to quit the rest of this race. All in all a very nice sailing day. And a good concept for those of you who want to train and don't want to have a rib, a starting boat and a racing committee out on the water. Every 21st of July (Our Belgian National Holiday), we race to the nature reserve 'Het Zwin' and back. Today we had lovely sailing weather, a nice breeze (7 to 11 knots) and sun all over the place! There were 50 boats in total, divided in two groups (C1 - 21 boats and C3). Our first start was great. We had clean air and started third from the committee boat. We have been practising on our upwind sailing and in this race we had all the settings right. The result was that we were 2nd at the upwind mark! Downwind we lost just a little and could make up for it on the second upwind. After this we had a long upwind stretch along the coast. Because the wind came from over land and we were close to the coast it was very unstable, so we had to work it a lot. Eventually we finished in third position and we were thrilled. Our start was not as good as the first one and we were in the middle of the pack. We could tack away but still had no clean air. The ones with clean air sailed faster and higher, something that would we difficult to make up for. Halfway the first upwind run we had room to tack and finally got clean wind. However we couldn't keep the speed up as in the first race. We had moved the jib out on the track and now we had difficulties to maintain a good heading. F#@&! After 2 loops in front of 'Het Zwin' we had the same stretch along the coast towards the finishing area. Again difficult sailing, but we managed to overtake some boats eventually. 2 cats had a blasting start and were waaaay ahead of everyone. We fought with about 5 cats for third place. During the race the wind started to decrease to about 8 knots in the end. I guess we were too late to trim the boat for lighter wind and couldn't keep up with the first two boats of our pack. After a very close finish we came in 6th. This made for a final score of 4 for the day. Very happy with this result! Next time we'll make sure to be in the Top 3. Up to our next race which will probably be the F16 Dutch nationals in Zandvoort, Holland. Another F16 model hits the water! Built/designed by Matt McDonald, producer of the US Blade F16, the new Falcon F16 is still a wave piercer like the Blade and shares many similarities. The Falcon takes the design evolution a few steps further, a more refined hull shape with additional volume, free board and styling highlight some of the changes made to the design. 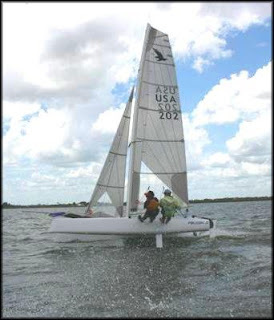 The goal of the designer was to create a platform that had equal or better upwind performance to that of the already proven very fast Blade, yet is more stable and easier to push in strong and gusty downwind conditions. Based on the boats first sail, those goals have been met and Falcon Marine looks forward to continuing to dial in the rig and prove how fast an F16 can be. Check out the website here. European Dealer for the Falcon is Hans from Catamaranparts Holland. Here are some pictures of the new Falcon. We can't wait to see one on European waters! 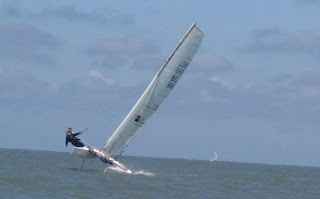 The F18 Worlds are held in Knokke, Belgium. Start this weekend and races planned for an entire week. We are sure going to have a look at all the top teams performing here. 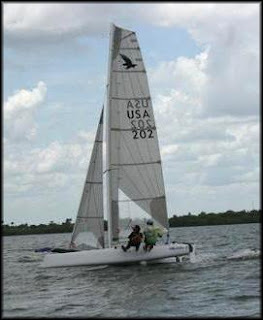 The website for the Worlds lists all the teams and boats to have a look at this week. 180 teams entered! Whoaw! Enjoy your weekend of sailing everyone! And good luck to all the Worlds participants, let the game begin. 3rd F16 arrived in Knokke-Heist! 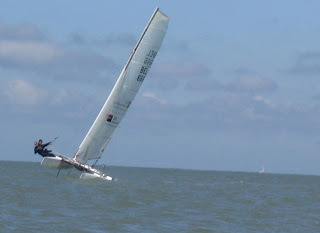 Last weekend the 3rd Formula 16 catamaran arrived in Knokke-Heist. It is great for us and shows that the concept slowly gets known in Belgium and that it has started to grow. The other great thing is that all three boats together show the versatility and flexibility of the concept. The guy who just bought the Viper F16 sails it with his daughter, while the guy at our club is mostly a single handler, ocasionally sailing 2up). After the first 2 days of sailing they were very happy about the boat and we hope to have a sail with them later. For more information about the Formula 16 concept and the Blade F16 in particular or a test sail, feel free to contact me. As last year the one up cup was held again at the RBSC Zoute. 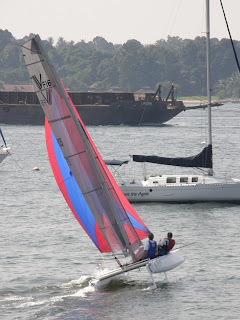 It's is a great location to sail and the races are very well prepared. And I should forget the great barbecue they have! Also this year the A-cat Belgian nationals were held during the same weekend. 13 A's turned up so I was confident there would be a nice racing field. Both of the racing days were quite comparable to each other. Both started with lots of fog and about 7 knots of wind. Towards the end of the day the wind gradually dropped to about 4 I guess. Great thing that there were only three of us racing was that you could really concentrate on getting settings right (because you hardly ever had someone near you) and I learned a lot about pointing and getting to feel the boat in light conditions (there simply was no one to follow). Generally I could say that I could trap out faster then the FXones upwind (but those A's are trapping out even faster! It is really unbelievable how little wind they need to go on the trapeze). 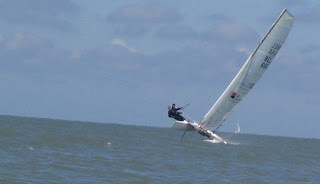 And when it was the case the Blade was a lot faster upwind. When the wind dropped and I had to sit in, I got away from the FXones, but I couldn't take a really big lead. On the downwind the difference between the Blade and FXones was bigger. I could easily fly a hull and when I did the Blade was a blast. When I couldn't fly a hull, the 'cruising' speed was a little higher then the speed of the FXones, but in the (small) gusts I accelerated a lot more and this gave a great advantage by the end of the downwind run. It was a great experience again to sail the Blade F16 singlehanded again and I can only encourage other singlehandlers to join the event again next year! In the one up class I finished first overall (results). The A-cat top three was: 1) Sjoerd Hoekstra(NED3), 2) Chris Field(GBR007, 3) Areno Terra (NED2) (full results).